The century-old document is a testament to colonialist double-dealing that left many Jews dead. Israel was reclaimed as the Jewish homeland in spite of it, not because of it. One hundred years on, the American Zionist movement is still celebrating and glorifying the Balfour Declaration. We teach about it in Hebrew schools as a landmark achievement and reference it in debates as an argument for Israel’s legitimacy. We heaved a sigh of relief when the British government officially rejected a petition urging it to apologize for the 1917 letter. I agree with the British decision to reject the petition, which was clearly an anti-Israel PR stunt, but I take great issue with the larger obsession with Balfour in the Zionist community. All Zionists should regard the Balfour Declaration not as an accomplishment but as a broken promise that led to the deaths of countless Jews. Those of us who are passionate about effectively combating anti-Israel boycotts and promoting peace and common understanding between Israel and its neighbors should see the document as a strategic obstacle rather than an asset—one that misrepresents the true origins and lessons of Israel. And Zionist activists should recognize that this failure to understand the Balfour Declaration in its full historical context is a sign of some disquieting truths about the contemporary Zionist community. In 1917, British Foreign Secretary Arthur James Balfour wrote a letter to Walter Rothschild, a prominent figure in the United Kingdom’s Jewish community, announcing Britain’s inclination toward “the establishment in Palestine of a national home for the Jewish people.” Chaim Weizmann, who would later become the first president of Israel and who was heavily involved in lobbying for British support of Jewish statehood, was reportedly disappointed by the wording of the document, although he touted it as a victory. The letter was vague and noncommittal. It mentioned a Jewish “home,” but not a “state” or a “commonwealth,” and it did not mention sovereignty or even a withdrawal of British troops. The phrase “in Palestine” allowed Britain the flexibility to choose how much, or how little, of Palestine should be provided for such a “home.” All in all, although it was the first time that a major world power had recognized Jewish national aspirations so publicly, the Balfour Declaration was far from a guarantee that Britain would stand behind the Zionist movement. In any case, Weizmann and his fellow activists were not the only party with which British officials were negotiating at the time. Even before Balfour sent his letter, Henry McMahon, the British High Commissioner in Egypt, had struck a deal with Sharif Hussein of Mecca in which he promised the pan-Arab nationalist movement and Hussein’s Hashemite family control over enormous swaths of land, including, arguably, Mandate Palestine. Meanwhile, British diplomat Mark Sykes negotiated the Sykes-Picot agreement with his French counterpart, in which Britain pledged Mandate Palestine partly to itself and partly to France, leaving Jerusalem as an international zone. The Balfour Declaration, then, was only one of a number of overlapping and contradicting commitments that various members of the British government made to different parties whose support it sought in World War I. While it is hard to know whether Balfour himself understood this at the time that he sent his letter to Rothschild (he presented himself to Weizmann, at least, as a genuine supporter of Jewish self-determination), it is clear that the British government as a whole was playing all sides with little intention of keeping its word. As imperial powers often do, the United Kingdom was juggling its territorial possessions and its occupied subjects without any serious concern for the needs of those under its dominion. By 1918, members of the British government were already beginning to hedge on the idea of a Jewish national home. More important than the intentions of the British government or its members in 1917, however, are the practical actions of the British state following the Balfour Declaration. With full historical context, that declaration must at best be regarded as a broken promise. In 1921, it was the British colonial administration in Mandate Palestine that appointed Hajj Amin al-Husseini, infamous for his anti-Semitism and his later support of the Nazi war effort, “Grand Mufti of Jerusalem” and head of the Supreme Muslim Council. 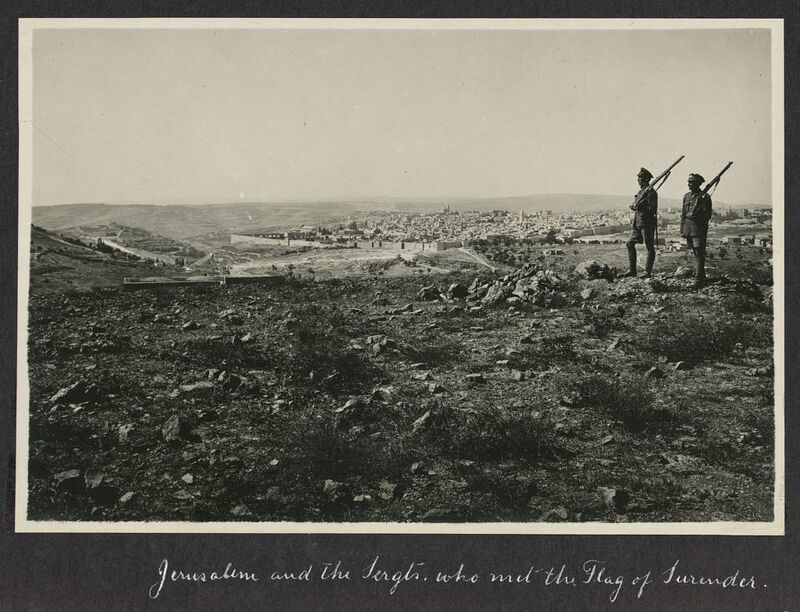 In 1922, just five years after Balfour’s letter, Britain began chipping away at Mandate Palestine, severing approximately four fifths of the territory and gifting it to the Hashemite regime of what is today Jordan, in doing so significantly reducing the land in which it was possible for the Jews to build a state. Worst of all, in 1939, Britain issued a white paper declaring that Jews would not be allowed a state in even part of Mandate Palestine, severely curtailing both Jewish land purchases and aliyah, and establishing the harsh immigration regime that made Palestine virtually inaccessible as an escape route for Jews fleeing from the Nazis. 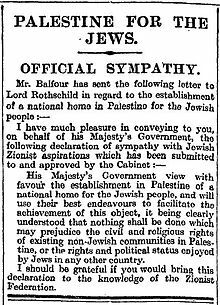 Whether Balfour was genuine in his support or not, the British government as a whole failed to keep its promises to the Zionist movement. Had a Jewish state, or even a semi-autonomous “national home,” in fact been established in any part of Mandate Palestine, European Jewry might have been saved. Instead, as the Nazis lined up Jewish families and shot them into pits, as European soldiers and civilians enslaved, raped, starved, robbed, gunned down, and gassed millions and millions of Jewish people, and as the Zionist movement begged for mercy from the British colonists who could at any time have opened the doors of the historic Jewish homeland and allowed Israel to serve as a refuge, the imperial British government watched with indifference. Rather than follow Balfour’s suggestion and tolerate the inconvenience of a grumbling Palestinian nationalist movement (the institutions of which the United Kingdom had a hand in establishing), the British imperial regime kept the doors of Mandate Palestine shut to Jewish refugees and let the six million die. Yet today, American Zionists celebrate. What does it mean that the Zionist movement in America, 100 years down the line, is still glorifying the Balfour Declaration and the British Empire’s role in Mandate Palestine? What does it say about us that we still claim that ersatz stamp of approval as a badge of legitimacy, even pride? To me, it says that we have lost our sense of direction in some fundamental ways. First of all, we have lost our sense of history. We have become prone to revisionism and collective amnesia, especially with regard to Europe’s historical treatment of the Jews. We have forgotten how hard Jews have had to fight, every step of the way, in order to win statehood, including Zionist revolutionaries’ revolt against British imperial forces. Israel’s modern-day strategic alliances with European powers like the United Kingdom, while important in their own right, have allowed us to forgive and forget. We have lost all sense of how to make our case. Anti-Zionists, naturally, use the Balfour Declaration as evidence for their allegations that Israel is a colonial cancer in Southwest Asia. They seize upon every opportunity they can to associate Israel and Zionism with the British Empire, and the Balfour Declaration serves as a tool for them to translate traditional anti-Semitic notions of Jewish power into a political narrative that appropriates the discourse of anti-colonialism into a violent opposition to Jewish statehood. I’ve traveled to Jordan twice over the last year, and on both occasions I heard the Balfour Declaration referenced time and again to prove that Britain “gave” Israel to the Jews (an ironic claim from citizens of a country that Britain did, in fact, give to the monarchy that still reigns). I’ve heard the same thought echoed many times on my campus. As long as we teach the Balfour Declaration as a source of legitimacy, we put ourselves on the wrong side of history. This is especially problematic for young Jews, like myself, who frequently find ourselves defending Israel against all sorts of detractors. If our Jewish communities only provide us with old talking points—like Balfour’s letter as an indication of Israel’s legitimacy—and not with the historical context and nuance to make our own judgments and craft our own cases, we won’t be prepared take on the rapidly evolving attacks we face. Perhaps discussions of colonialism and its legacy were less central to academic and political debates in the past, but today we must be able to engage critically with Israeli, Jewish, and Zionist history in those contexts if we want to keep up. Finally, in uncritically championing Balfour, we have lost our sense of the Zionist movement as one based on principles of justice. Zionism is about speaking truth to power, about standing up to Europe and to the world that has betrayed us so many times and claiming our rights. Israel exists because Jews willed it into existence, because pioneers built it from scratch, because rebels fought for decolonization and British withdrawal, and because Israeli soldiers died on the battlefield defending it. It is a testament to Jewish agency and solidarity, to the Zionists’ refusal to let the world beat them. Zionism is about liberation, justice, and self-determination. When we allow Israel to be labeled a product of the widely hated British Empire, we surrender both our agency and our purpose. The Zionist movement forgets the essence of Zionism. We can and must do better—and we can start by calling off the celebrations of the Balfour Declaration.